I was invited to a workshop sponsored by ISAT/DARPA entitled The EverCloud: Anticipating and Countering Cloud-Rot that arose from Yale's EverCloud project. I gave a brief statement on an initial panel; an edited text with links to the sources is below the fold. I'm David Rosenthal from the LOCKSS (Lots Of Copies Keep Stuff Safe) Program at the Stanford University Libraries. For the last 15 years I've been working on the problem of keeping data safe for the long term. I'm going to run through some of the key lessons about storage we have learned in that time. First, at scale this is an insoluble problem, in the sense that you are never going to know that you have solved it. Consider the simplest possible model of long-term storage, a black box into which you put a Petabyte and out of which 100 years later you take a Petabyte. You want to have a 50% chance that every bit you take out is the same as when it went in. Think of each bit like a radioactive atom that randomly decays. You have just specified a half-life for the bits; it is about 60M times the age of the universe. There's no feasible experiment you can do that would prove no process with a half-life less than 60M times the age of the universe was going on inside the box. Another way of looking at a Petabyte for a Century is that it needs 18 nines of reliability; 7 nines more reliable than S3's design goal. We are going to lose stuff. How much stuff we lose depends on how much we spend storing it; the more we spend the safer the bits. Unfortunately, this is subject to the Law of Diminishing Returns. Each successive 9 of reliability is exponentially more expensive. We need to trade off loss rate and cost, so we need a model of the cost of long-term storage. This matters because the main threat to stored data is economic. If data grows at IDC's 60%/yr, disk density grows at IHS iSuppli's 20%/yr, and IT budgets are essentially flat, the annual cost of storing a decade's accumulated data is 20 times the first year's cost. Different technologies with different media service lives involve spending different amounts of money at different times during the life of the data. To make apples-to-apples comparisons we need to use the equivalent of Discounted Cash Flow to compute the endowment needed for the data. This is the capital sum which, deposited with the data and invested at prevailing interest rates, would be sufficient to cover all the expenditures needed to store the data for its life. Until recently, this has not been a concern. Kryder's Law, the exponential increase in bit density on disk platters, meant the cost per byte of storage dropped about 40%/yr. If you could afford to store the data for a few years you could afford to store it "forever"; the cost rapidly became negligible. We built an economic model of the cost of long-term storage. 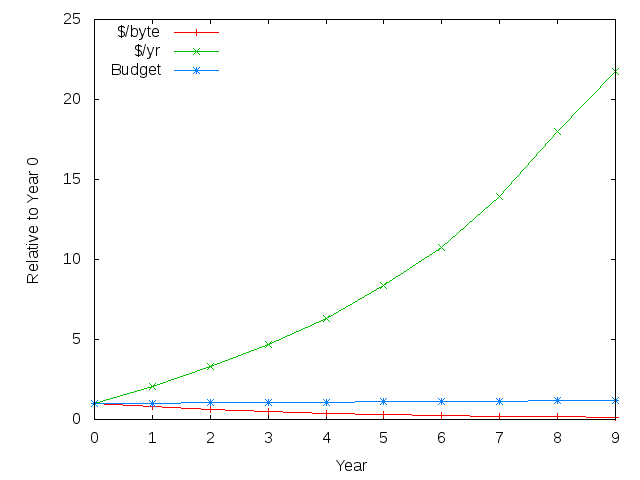 Here it is from 15 months ago plotting the endowment needed for 3 replicas of a 117TB dataset to have a 98% chance of not running out of money over 100 years, against the Kryder rate, using costs from Backblaze. Each line represents a policy of keeping the drives for 1,2 ... 5 years before replacing them. The endowment needed increases sharply. 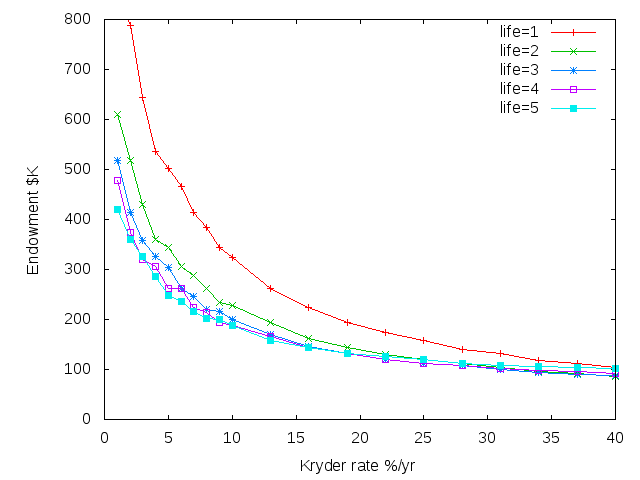 The endowment needed becomes harder to predict, because it depends strongly on the precise Kryder rate. As Randall Munroe points out, in the real world exponential growth can't continue for ever. It is always the first part of a S-curve. Just as with Moore's Law, Kryder's Law is flattening out. Here's a graph, from Preeti Gupta at UCSC, showing that in 2010, even before the floods in Thailand doubled $/GB overnight, the curve was flattening. 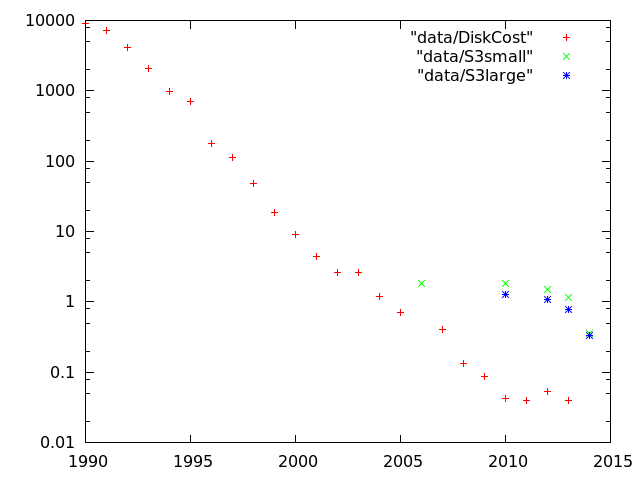 Currently, disk is about 7 times as expensive as it would have been had the pre-2010 Kryder's Law continued. 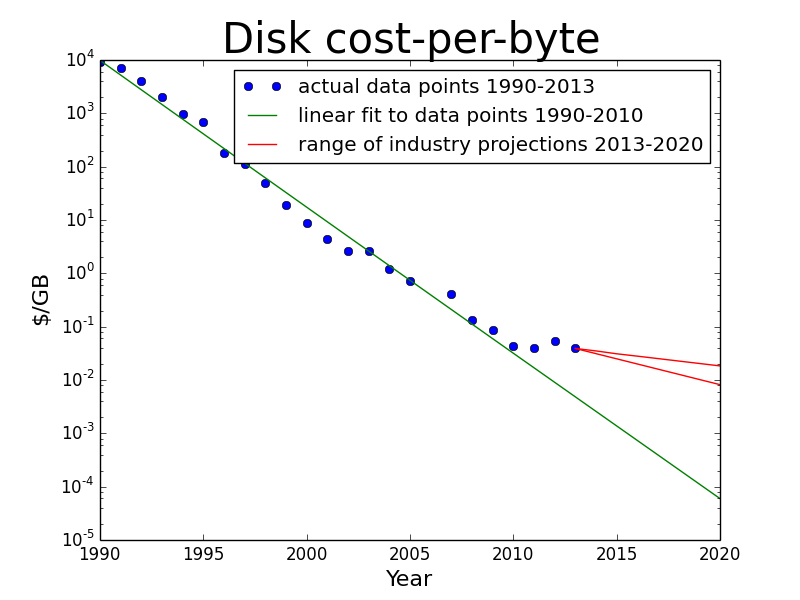 Industry projections are for 10-20%/yr going forward - the red lines on the graph show that in 2020 disk is now expected to be 100-300 times more expensive than pre-2010 expectations. Initially, S3 was somewhat more expensive than raw disk. Fair enough, it includes infrastructure, running costs and Amazon's margins. 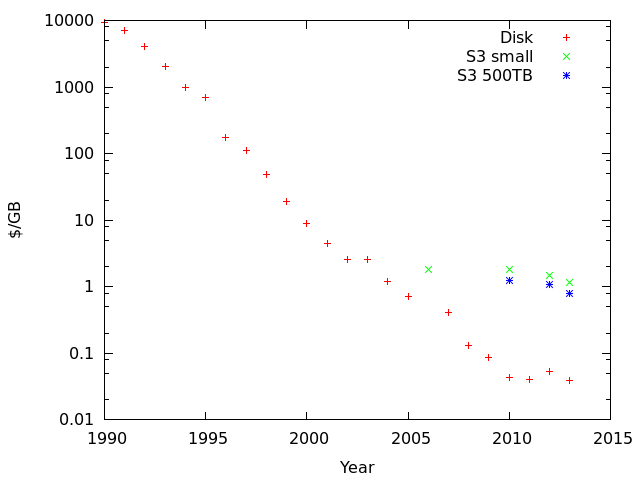 S3's Kryder rate is much lower than disk's, so over time it becomes a lot more expensive. Here is our economic model comparing 3 local replicas with a 3-year drive life to S3 and Glacier. Glacier and local disk look about the same. But this isn't an apples-to-apples comparison. Disk's Kryder rate is projected as 10-20%/yr. 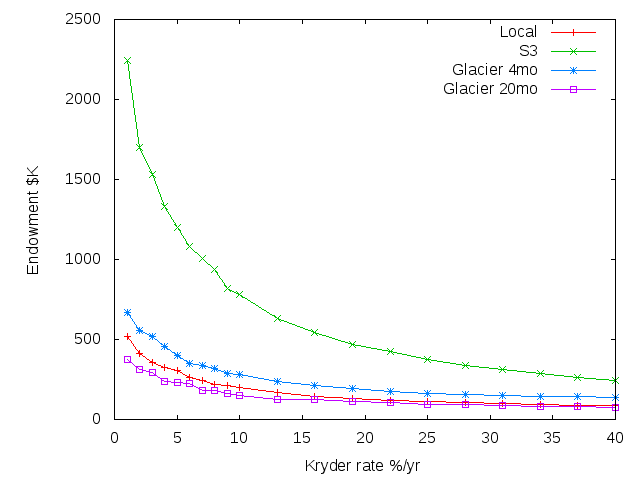 Glacier's 1c/GB/mo rate is unlikely to change for a long time, its near-term Kryder rate will be zero. So even Glacier is significantly more expensive than doing it yourself. The justification for using the cloud is to save money. For peak-load usage, such as intermittent computations or temporary working storage, it certainly does. Amazon can aggregate a lot of spiky demands so they pay base-load costs and charge less than peak-load prices. Customers avoid the cost of over-provisioning to cope with the peaks. There are no spikes for Amazon to aggregate. To be cheaper than Amazon, your costs don't have to be cheaper than Amazon's, they only have to be cheaper than Amazon's costs plus Amazon's margins. Amazon was simply following in the tradition of any large company that gains control of a market. “You lower your prices until the competition is out of the picture, and then you raise your prices and get your money back,” [Steven Blake Mettee] said. Google's recent dramatic price cuts suggest that they are determined to make the cloud a two-vendor market. But, as we see with the disk drive business itself, a two-vendor market is not a guarantee of low margins. Amazon cut prices in response to Google, but didn't go the whole way to match them. Won't they lose all their customers? No, bandwidth charges act to lock-in existing customers. Getting 1PB out of S3 into a competitor in 2 months costs about 2 months storage. If the competitor is 10% cheaper, the decision to switch doesn't start paying off for a year. Who knows if the competitor will still be 10% cheaper in a year? A competitor has to be a lot cheaper to motivate customers to switch. Every few months there is another press release announcing that some new, quasi-immortal medium such as stone DVDs has solved the problem of long-term storage. But the problem stays resolutely unsolved. Why is this? Very long-lived media are inherently more expensive, and are a niche market, so they lack economies of scale. In 2009 Seagate did a study of the market for disks with an archival service life, which they could easily make, and discovered that no-one would pay the extra for them. Double the reliability is only worth 1/10th of 1 percent cost increase. I posted this in a different forum: Replacing one drive takes about 15 minutes of work. If we have 30,000 drives and 2 percent fail, it takes 150 hours to replace those. In other words, one employee for one month of 8 hour days. Getting the failure rate down to 1 percent means you save 2 weeks of employee salary - maybe $5,000 total? The 30,000 drives costs you $4m. Update: After the talk, I updated the graph that included S3 pricing to reflect Amazon's response to Google's price cut. It shows the dramatic size of the price cut, but also that the result is that the discount you get for renting large amounts of space has been greatly reduced. Before the price cut, the first GB cost $0.095/GB/mo and half a petabyte $0.065/GB/mo, or 68% of the first GB. After the price cut, the first GB costs $0.03/GB/mo and half a petabyte costs $0.0285/GB/mo, or 95% of the first GB. Rackspace is reluctant to engage in the price war, supporting my contention that the cloud services market will end up with two vendors.